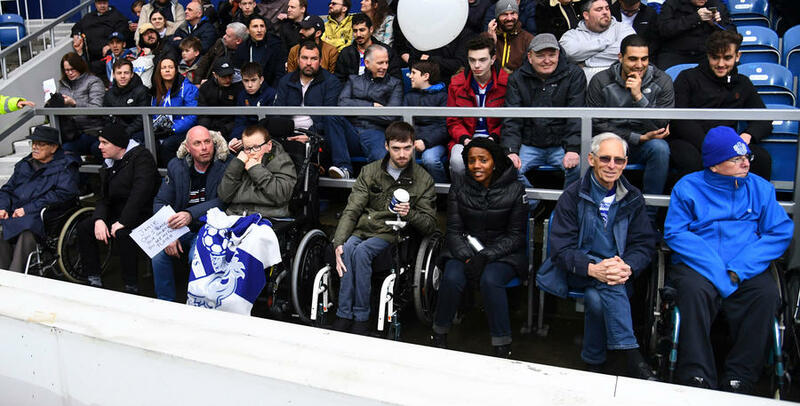 Disabled and ambulant supporters are an integral part of our fan-base at Queens Park Rangers Football Club and we look forward to welcoming you to Loftus Road. To book tickets, please call the Box Office on 08444 777 007, or if you would like any further information on facilities, please e-mail the QPR Box Office - [email protected]. NB: Receipt of an Orange / Blue badge will not be considered sufficient proof of disability for the concessionary ticket price. These places are provided at a concessionary price (subject to other concessions where applicable e.g. pre-game/online booking) payable by the disabled person using the wheelchair. Should a personal assistant be required, they will not be charged. Away fans who use a wheelchair enter through Turnstile Block 1 on Ellerslie Road, and not through Turnstile Block 2 on Ellerslie Road or Block 3 on South Africa Road. As with all ticket categories at Loftus Road, we strongly advise that you secure your tickets prior to matchday to avoid disappointment. Wheelchair supporters are also able to bring a carer free of charge. Ambulant supporters are able to purchase tickets in any area of the ground except Platinum, provided there are no health and safety issues. However, if they buy tickets in the Gold, Silver and Bronze areas of the ground, they will be eligible to receive the discounted ambulant concession (the same as the Senior concessionary rate) and, if required, are able to bring an accompanying carer free of charge. For ambulant supporters who require a wheelchair to get to the stadium, but are not necessarily confined to their wheelchair, the club are able accommodate a limited number of wheelchairs in Alton House reception during their visit to Loftus Road. Please contact [email protected] in advance to ensure availability. For the purposes of this policy and the administration of the concessionary ticketing policy, both categories of people will be termed 'ambulatory disabled supporters' and those supporters with ambulatory disabilities of a severe nature will qualify for the concessionary treatment and have access to seating nearest the entrances/exits. Provision will be in "designated areas" only and should the individual not wish to sit here, they forfeit the entitlement to a disability related concession. Eligibility to these areas will be dependent on providing proof of disability (as described above) or will be decided on individual merit based on information provided to the QPR Box Office; this information will assist in determining each individual's suitability for use of the facilities. The Club has positions for visually impaired supporters and, if required, their personal assistants. Match commentary is provided by a dedicated audio described commentary and headsets are available at the Alton House entrance on South Africa road. Please contact Fiona Hodgson on 0208 740 2520 or e-mail her at [email protected] to organise this service. Eligibility for this concession requires proof of disability as described above or each person can provide a copy of their registration document which certifies they are Registered Blind or Registered Partially Sighted, or provide qualifying documentation from their optician equivalent to registration requirements. Guide Dogs are allowed into the stadium, but we would recommend that supporters with Guide Dogs contact the Club before the match so that we can discuss with them access into the ground, facilities inside the ground and the welfare of the Guide Dog before, during and after the match. Providing the Box Office has been informed that the supporter is hearing impaired, a steward will be informed local to where they are sitting who will be on hand to help if there are any issues. If there is a stadium evacuation, or a safety notice is broadcast on the PA system, the steward will make the supporter aware. It is also strongly recommended that each hearing impaired person attending a match at Loftus Road is accompanied by a person aged 16 or over who is fully able to support their needs in the event of an emergency. Please be aware that due to stadium configuration, there are some areas of the ground from which the big screen is out of view, and this can be used to broadcast important messages, so for the optimal matchday experience you may wish to contact [email protected] for advice on where best to sit. Fans registered with the Club as disabled are eligible to bring a carer free of charge if required. The quoted prices are for Disabled Adults, Seniors Over 60 and Young Adults 18-21 only. Disabled Juniors Under-18 and Kids Under-8 supporters pay the standard concession price and are entitled to a free helper. We aim to ensure that supporters with autism are well accommodated at Loftus Road. In February 2015 the club won an Autism Access Award, demonstrating the club’s commitment to making Loftus Road an autism friendly stadium. If you require any further information please do not hesitate to contact the Box Office on 02087 402 613 or alternatively e-mail [email protected]. Queens Park Rangers Football Club is conscious of a growing elderly population and wish to consider their needs in order for them to be able to continue watching matches whenever possible. With this in mind it is proposed that those elderly people suffering from an infirmity which prevents them climbing large numbers of steps should be able to request a seat in the most accessible part of the stadium (i.e. nearest the entrances/exits). Please advise the Ticket Office of this request at the time of booking. Should their infirmity be so severe that the supporter cannot manage more than one or two steps, they may be entitled to the concession offered for ambulatory disabled supporters (see above). Supporters with learning difficulties can normally be accommodated in any part of the stadium in normal seating. However, if, for any reason, a person with a learning difficulty feels that ordinary stand seating would be unsuitable for them, they will be entitled to sit in the disabled concessionary areas and receive the appropriate concession (including the FREE carer seat). Please contact the QPR Customer Services Line on 0208 740 2613 for further information. Queens Park Rangers Football Club recognises that disabled people have families who may wish to attend matches as a family unit in much the same way as non-disabled people would. The Club will try and accommodate such requests although this may not always be possible. There is one toilet in each stand with a choice of "sided" transfers. These toilets are alarmed. If you experience any problems with use of the disabled toilets (or feel that they are being abused), please contact the nearest steward on the day or the QPR Customer Services Line on 0208 740 2613 after the match. The Club has many facilities available on matchdays and non-matchdays which aren't directly linked with actually watching the match. Such facilities include the Superstore, lounges, suites and executive boxes. The Club has carried out an informal DDA Audit of these facilities and a review is currently on-going. Useful information for disabled supporters regarding facilities at grounds across the country can be found on the Level Playing Field website - www.levelplayingfield.org.uk. Queens Park Rangers Football Club's stewards are trained in the FSQ modular system, which includes a disability module. Elements of staff training which relate to 'disability awareness' and 'disability etiquette' have been identified and a training programme will be instituted to ensure that awareness and etiquette is observed. This training programme will be on-going. Queens Park Rangers Football Club is forcefully committed to developing a "can do" culture by introducing such training and it will remain the hub to the further development of this policy. As part of its disability awareness, Queens Park Rangers Football Club will undertake to have Loftus Road audited annually for accessibility for disabled people. This is a key component of The Equality Act 2010 and FA Guidelines. We advise all fans not to travel by car to the ground due to no parking facilities. Alternative public transport routes are advised. Not all tube stations close to the ground are wheelchair accessible. The closest wheelchair accessible station is Wood Lane, which is just 10 minutes away. This station has access to the train from the platform via a manual boarding ramp, as well as lifts. All Transport for London (TFL) bus routes are now wheelchair accessible. Around 2 hours before kick-off, South Africa road is then closed. Prior to that, any bus stop on South Africa Road is advised. After the road closure, the bus stops closest to the stadium are at White City station, or on Bloemfontein Road. All London Style ‘Black Cabs’ are wheelchair accessible and can provide a suitable alternative to the bus or car. After the road closure has gone in, the recommended drop off point is the Bloemfontein junction with South Africa Road, which is 150m from the West Paddock Stand entrance.